I LOVE Halloween, and being all festive. I love everything pumpkin, whether it’s in a food or beverage. I would have to say that the only thing I DON’T love about Halloween is pumpkin carving. I ‘m not that great of an artist and that little carving knife presents even more of a challenge. So, when I saw this wonderful pumpkin idea, courtesy of Jaderbomb, I have found a new way to show my love for pumpkins! 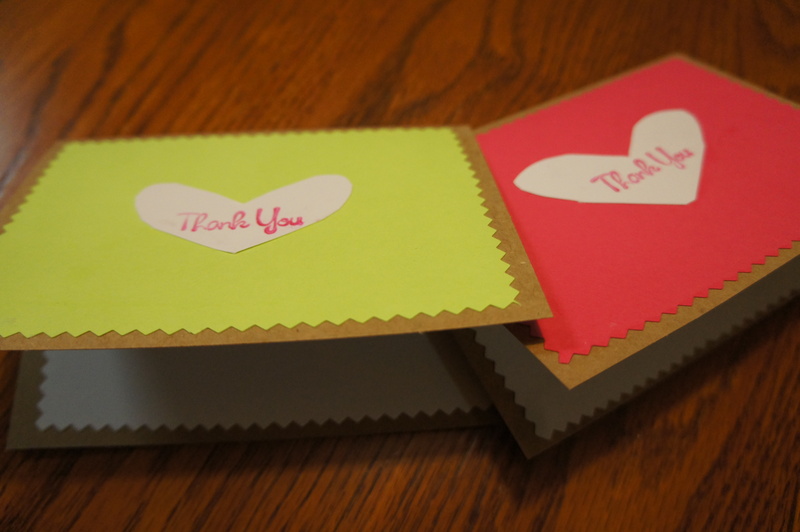 After Cecilia’s baby shower, I had the wonderful idea to make all my thank-you cards by hand. I should note that before this time in my life, my parties normally consisted of alcohol and debauchery. We would pre-party at my place and then venture out to midtown, giving all power to the streets and hoping that everyone would end up alive. This is not the kind of stuff that requires thank you cards to all the guests, welcomed or not. What would I think them for anyway, drinking all my beer and eating all of my food? Needless to say, this would be my first time making my own thank you cards. Between people who came to the party or sent gifts, we have a list of about 40 people or so to send cards to. I grabbed some cardstock and card sets and got to work. Well, it’s been a couple weeks and I have 25 cards crafted. Still need to write a note in each of them, but man….I had no idea how much work that is! I’m going to start my next stack tomorrow and hopefully I can knock another 10 down. As much as I have been complaining, this is definitely the way to go. It’s relatively inexpensive and I would rather a handmade card than a store-bought package of cards any day! Hoping to hone in on my skill a little more before we send out Christmas cards! Before I got pregnant, babies weren’t really in my future. 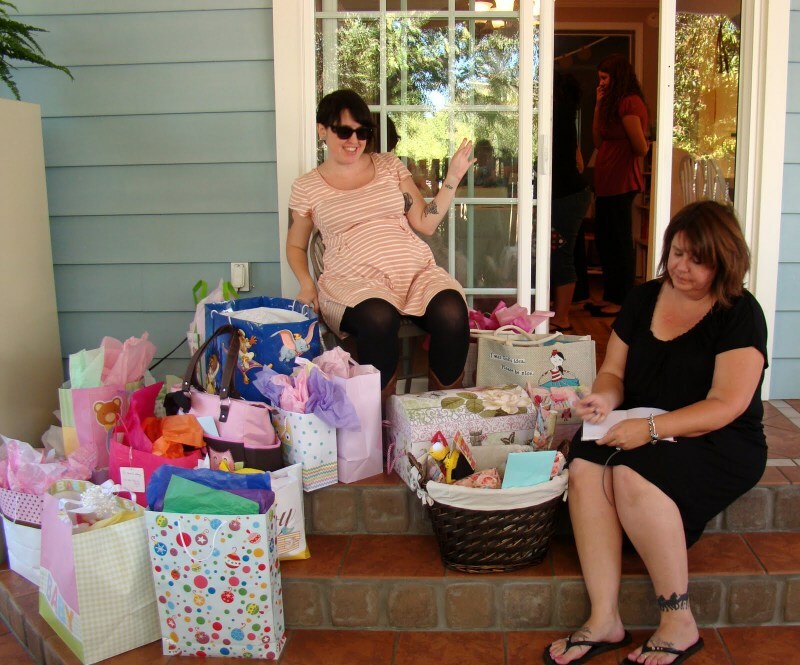 I had a few friends who had them and I had maybe been to 1 or 2 baby showers that I could remember, if that. I had no idea what babies needed…until I stepped foot into Babies R Us. The first time there, I started sweating and was completely overwhelmed by everything. Did we really need wipe warmers? And grocery cart covers, really? 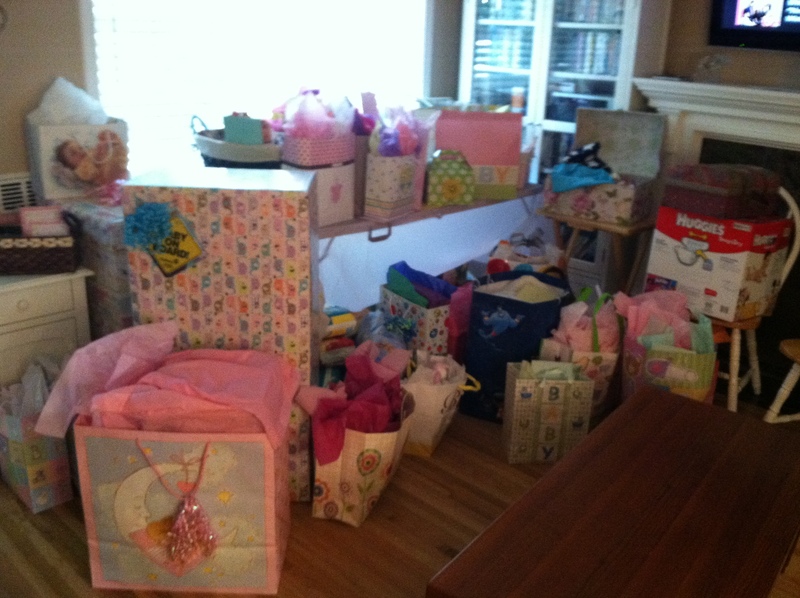 I knew we needed somewhere for the baby to sleep and some clothes for her, but all of this…damn. Walking to the car after my first visit, I swore to myself that I would never step foot in that store again. 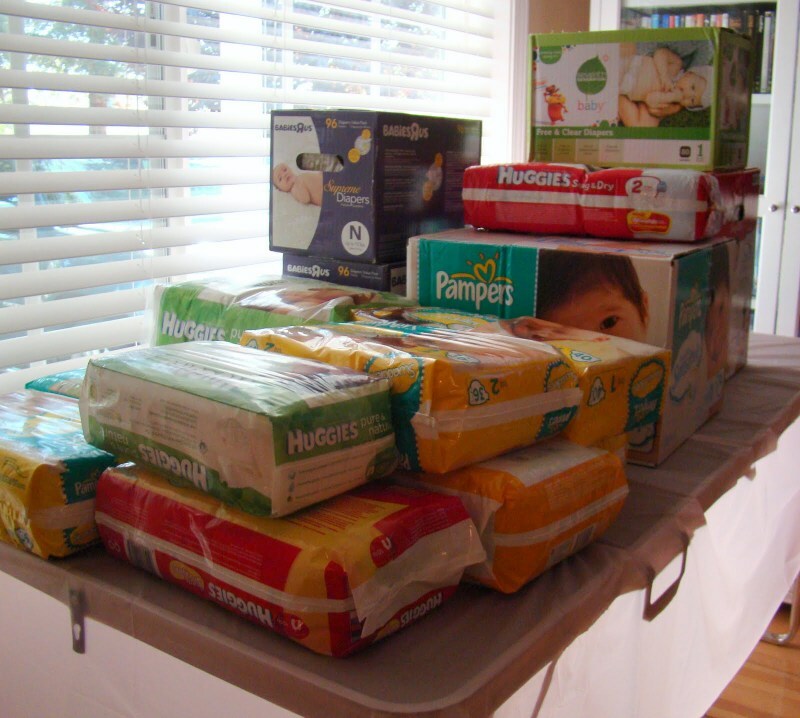 But before I knew it, we were planning my baby’s first party and continuing the tradition forebabymothers who had trudged this territory before me, I was back in that damn store to register. After my mom and I tried, and failed, to battle the registry list by ourselves with that trusty price gun, we surrendered to the Babies R US gods and got our very own guide to take us around the store and show us EVERY single thing we needed (and some we didn’t…). I was sure nobody would buy half the stuff on the list. After the multiple trips up the stairs to my apartment with all of this baby gear, I had a new purpose in life. Find room for all this stuff. When we first looked at apartments, a friend told us we could save money by getting a one-room apartment since the baby wouldn’t need that much living space for a couple years. At first, I kept the door shut and pretended that it didn’t exist. When that stopped working, I decided I would spend an hour or two a day on her room and after a couple weeks, this is where we are. 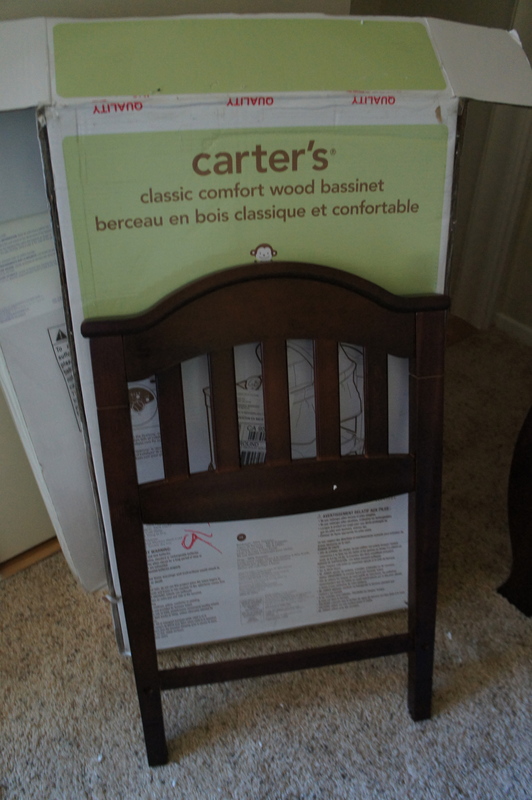 Obviously I’m not as handy as I thought I was, and we still need to get the bassinet together. While I love the way it looks so far, I’m hoping that after this weekend, I can walk in there without my skin crawling. I’m also hoping that Cecilia won’t have a deep-seeded hatred and/or fear of owls. 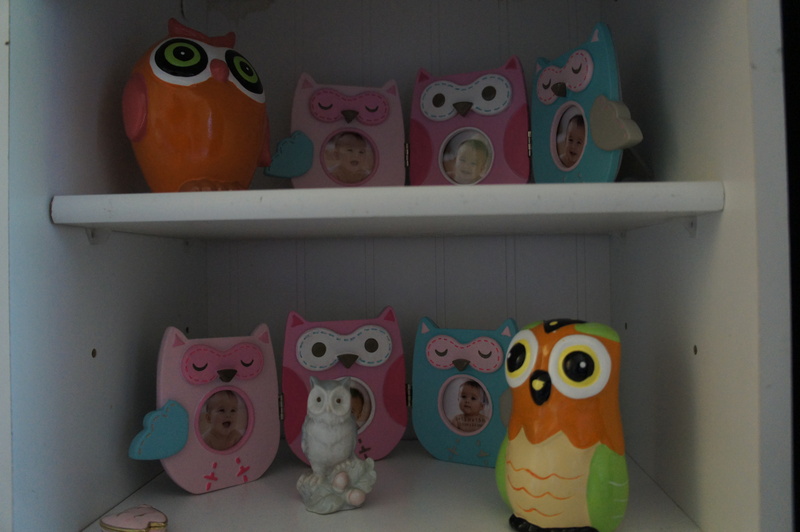 Bonnie Forkner authors one of my favorite blogs, Going Home to Roost, and she also sells her crafts on etsy. Her journey has taken her from North Carolina to Colorado and most recently, to California, so her husband could follow his passion of being a cycling coach. Forkner’s blog focuses on the very things that I love, “everything handmade and homegrown.” Feeling inspired, I asked Forkner about how she got her start blogging and how she makes it all happen. What made you decide to become a full time blogger/etsy shop owner? Was it over time or did something just click and you knew that’s what you wanted to do? I’ve always been a creative, but didn’t always know what i wanted to do with it. It wasn’t until after college that I really decided that I wanted to blog and sell on etsy. It took several months of thoughtful planning and a full year before I quit my day job, but with dedication, it happened! What were your biggest fears? How did you overcome them? Do any of those fears still exist? 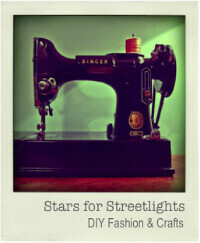 How long did you do DIY crafts/gardening/cooking for before deciding to start your own creative business? It seems like forever! That’s really one of the main reasons are started blogging. I was crafting, re-upholstering and making new recipes all the time and really wanted a place to share them all. Definitely my mom. She is the source of all of my creativity and is a constant inspiration to me. She’s always there for me and helps me with new business ideas and creative projects. Where did you come up with the idea for the Roost Tribe? How has that helped your business grow? 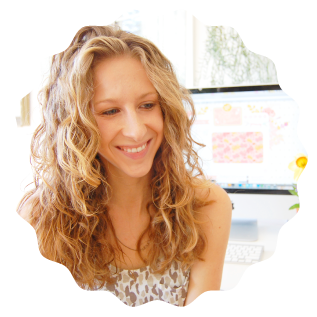 I was just discussing the blogging business with one of my friends this past summer when inspiration struck. I started to envision something that I, myself, would love to be a part of. Something that was incredibly affordable for the individual, but had potential to generate revenue as well. It dawned on me that after learning so many things the hard way, I would have *died* to have been able to be a part of something like the roost tribe in my earlier years. I realized that I had information and talents that others could benefit from and also had designs, recipes and other goodies that i wanted to share with people. Basically, I dreamt up something that would be fun, engaging, educational and totally worth 5 bucks. Where do you want to take this next? You seem to do it all, how do you manage your time? I don’t! Haha. I make a lot of lists and try to stay on task. I work too much (as most creatives do) but i try to turn my brain off when it’s not work time so that I can be fully present in the other areas of my life. When I’m not working on a project, you can find me out in nature, running and traveling with my sweet husband. 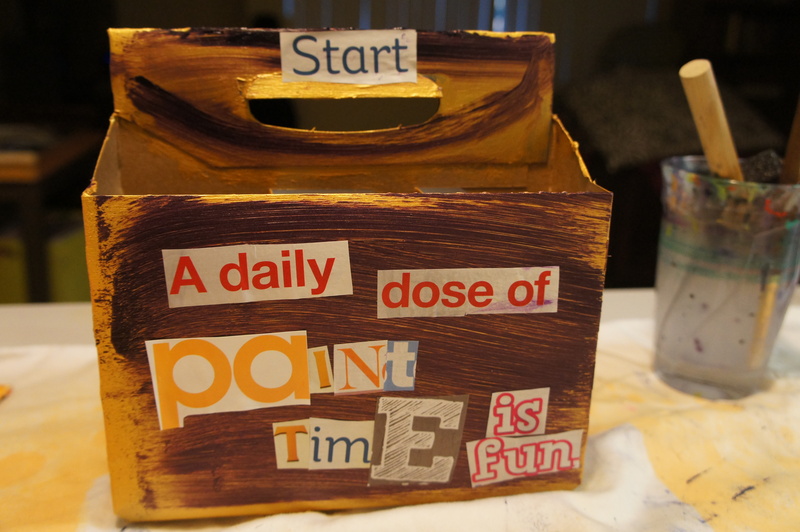 What advice do you have for someone who is trying to start their own creative business? Sometimes the hardest thing can just be to START. I encourage you to do at least one thing every day that leads you in the direction of your dreams. Take baby steps and never give up! If you want to find out more about Going Home to Roost or learn more about joining the Roost Tribe, visit goinghometoroost.com. Well, I did it! I finally created an etsy account. Of course, I have a lot more things to make and post but it feels nice to have one! The shop is under recreatedlove since everything I make is recycled. I can’t wait to add more and watch this little baby grow! I love everything about pumpkins…picking them, carving them, their seeds, their spice that is added to every food and beverage imaginable during fall. I love it. 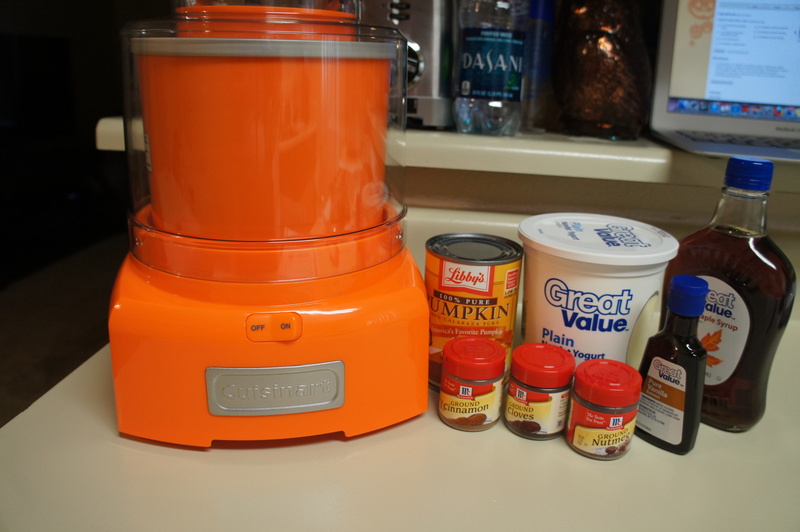 So when I came across a pumpkin frozen yogurt recipe, I was sold. The recipe I saw was on Domestic Peacock, but when I looked it up on my phone while I was out shopping, I could only find the allrecipes.com recipe. Since I bought all the ingredients to match the allrecipes.com recipe, I figured I would try that one first. Then, I would try the domestic peacock recipe if that didn’t work out. Well, I made it. 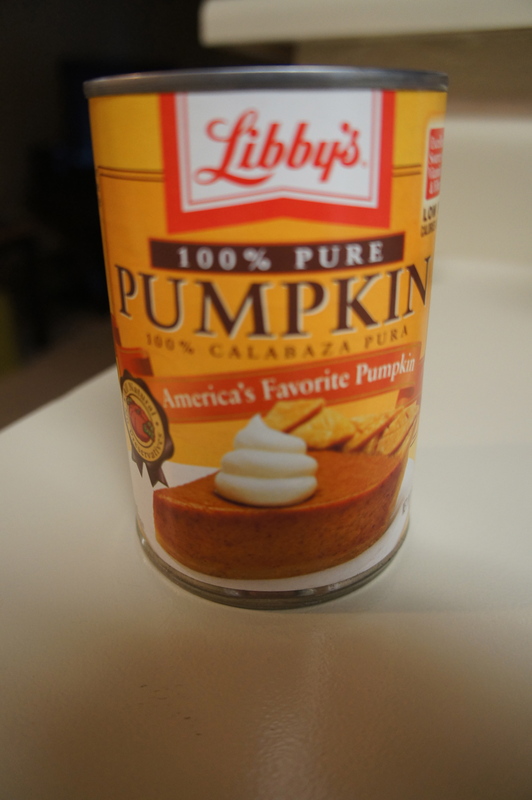 And I didn’t like it….which is a lot for me, because again….I LOVE PUMPKIN. I don’t think it mixed completely and it was wayyy too sweet for me. 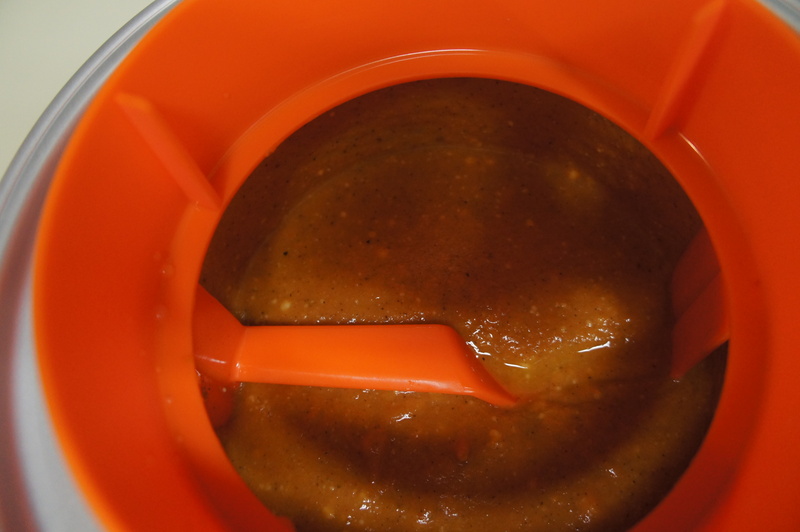 I tried making it in an ice cream maker but I think I will blend the ingredients first next time to see if that makes any difference. Next time, I’m going to try the Domestic Peacock recipe to see if that makes any difference. 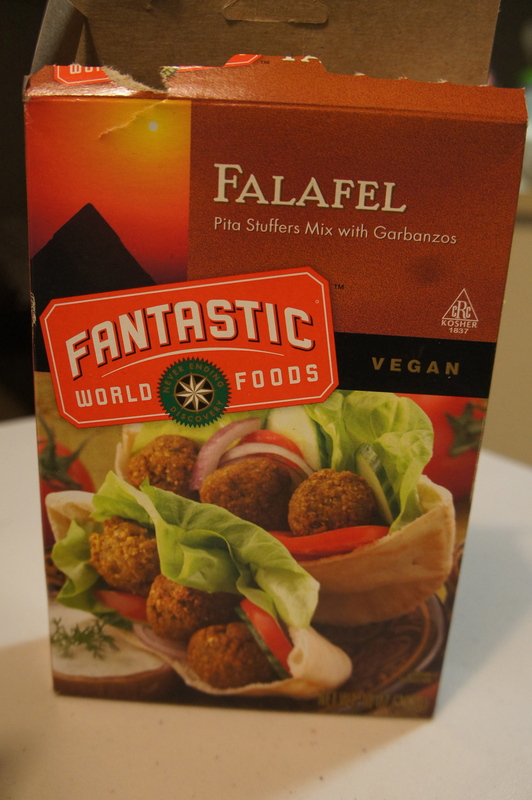 I’ve been looking at this Falafel box since I bought it, a lonnnng time ago. I finally caved and bought the ingredients to see if I could make this treat as good as it looked on the box. I followed the directions and even made my own yogurt dill dipping sauce (recipe is also on the back). And I must say, this is probably my favorite dish I have made so far. Instead of a pita, I used naan bread and I was completely in love. 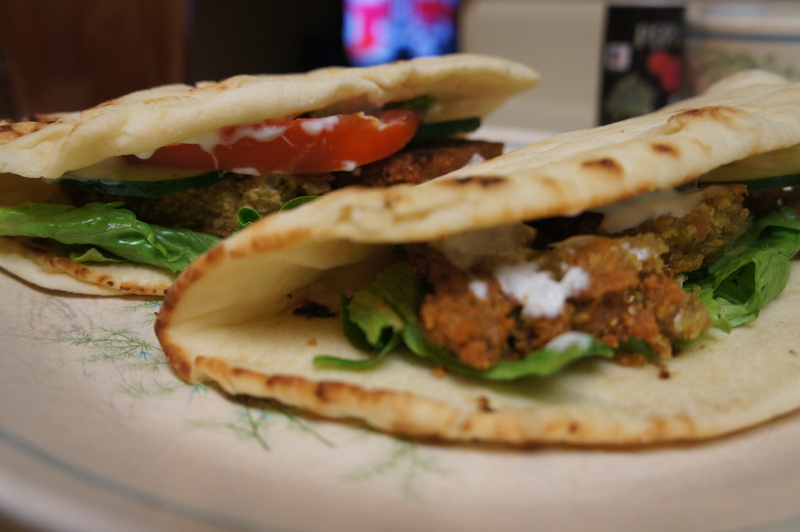 I will definitely be making this A LOT more often, maybe I can even make my own falafel mix next time. So, I’ve been working on my beverage holder project. I have one pretty much completed and that will hold my spray paints. It’s kind of lopsided though so I’m trying to think of a way to make it stand up straight. 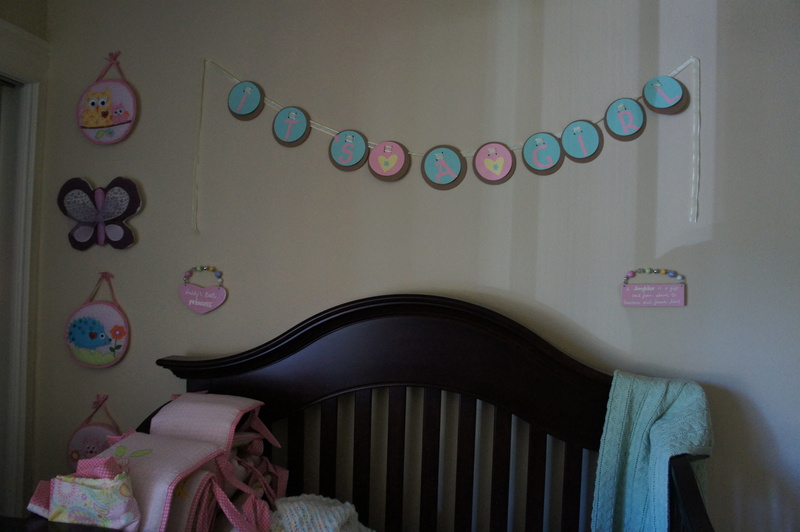 I think I will add cardboard to one side but if there are any ideas/suggestions out there…that would be amazing. 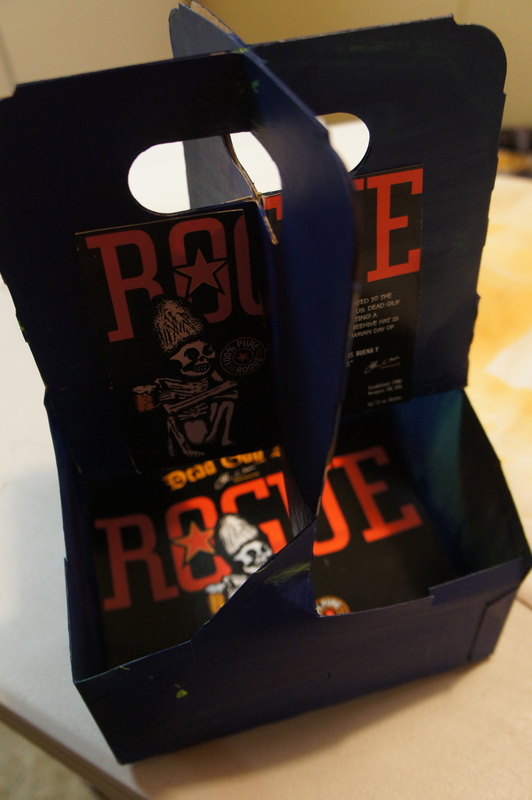 I’m also working on transforming a Bud Light 6-pack into a paint/brush holder for my paints. Took A LOT of layers to make the gold thick enough to cover all the writing. Then I got all crazy and thought I would add some purple…which I ended up not being the biggest fan of. Clipped some words out of a magazine and added that. I’ll probably add some more magazine clippings and maybe paint something on the side…but this is it so far. 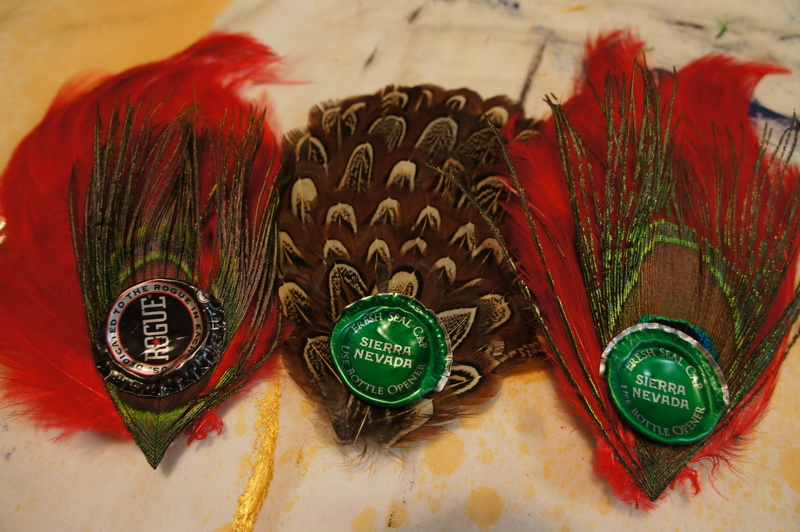 Finally, I’ve decided to get back into making hair accessories out of feathers and beer caps. I’ve made them before but I stopped for a while to focus on other stuff in my life. But I love making them and so I decided to pick it back up. Thinking of selling some of them on etsy. I bought the feather part from Michaels but I’m hoping to make my own feather designs soon.